During the summer Honey always asks the same questions. Ribs? Chicken? Or slow cooked Southern BBQ? You see he is all about grilling. And I love him for it. He handles the meat. I make the sides and set a pretty table. 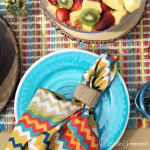 To celebrate the beginning of summer I’m sharing Summer Table Decoration Ideas to make even your most laid back gatherings special. 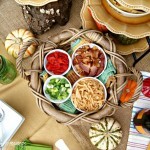 A fabulous centerpiece, simple dishes, and colorful linens can put the pizzazz into any occasion. 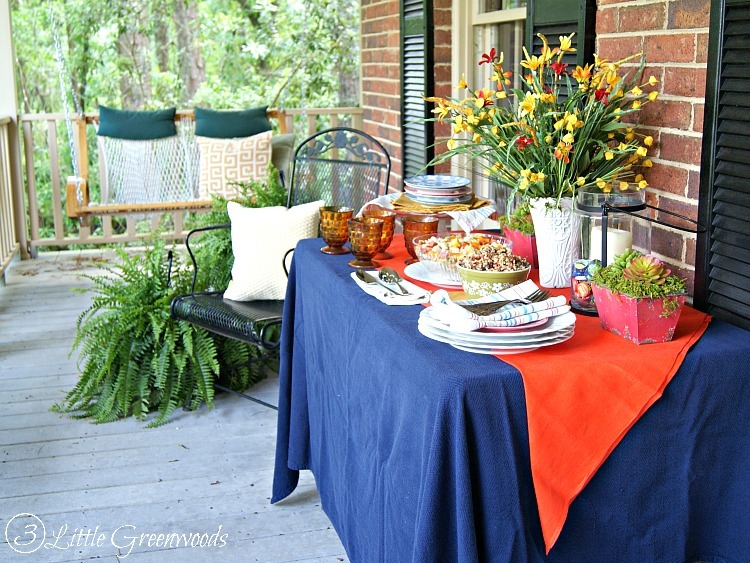 The foundation of any tablescape are the linens. One of my favorite table decoration ideas is to frequent our local thrift store for napkins and tablecloths. 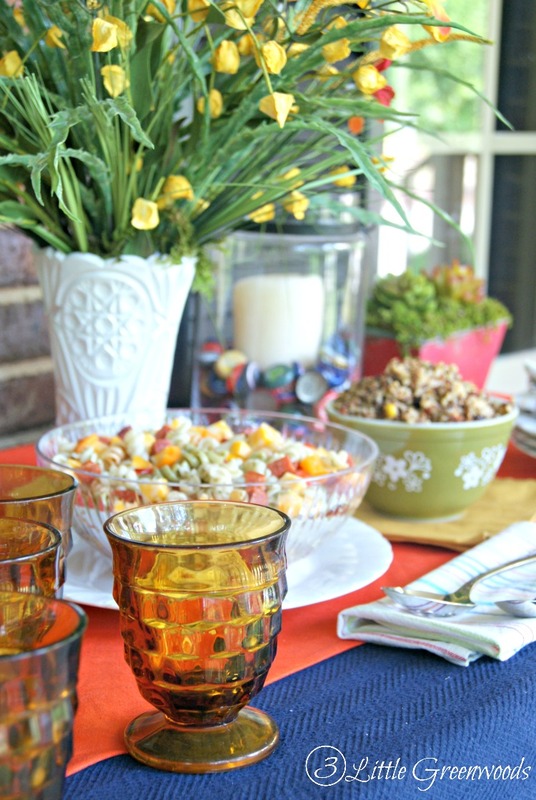 Just like with my thrifty Easter tablescape I totally scored inexpensive decor for my summer tablescape. I couldn’t resist this set of striped napkins for $2. They are colorful, super casual, and perfect for summer. I can already imagine how cute they will look at our next tailgating party. Having a set of white dishes on hand makes pulling together a stylish table a snap! Mix them up with inexpensive, patterned dishes to add interest to the table. These were picked up at Target for less than $2 a piece. A fabulous floral centerpiece is also a must. The colors in the arrangement echo the colors throughout the table. Yes, the flowers are faux. Real flowers are wonderful but needy. Now that the table is set and Honey is grilling it is time for me to whip up some tasty side dishes. Fresh pasta salads that are simple to make are perfect with whatever goodness he grills. While I was shopping I picked up pepperoni, colby jack cheese, and fresh peppers to mix into a fresh summer pasta. These make wonderful add-ins to the pasta salad. Setting out extra ingredients next to the pasta salad allows guests to add more of their favorite to the mix. It’s almost like a “make your own” pasta salad bar! 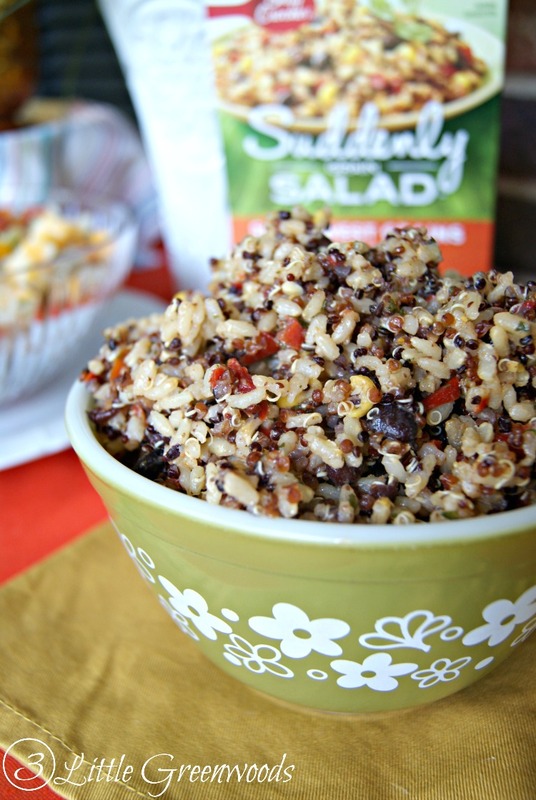 Our family really liked the unique textures and flavors in this whole grain salad. The brown rice and quinoa gives it a nuttiness and the chipotle vinaigrette gave it just enough kick. 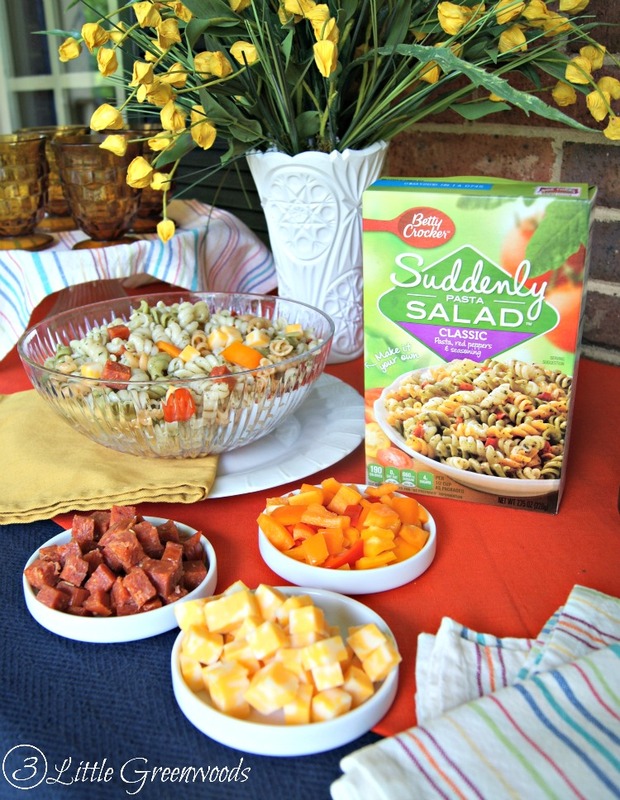 Starting with Suddenly Pasta Salads is such a quick and delicious way to celebrate summer. The pastas kits are so versatile that you can add whatever ingredients you’d like. There are a ton of fabulous fresh pasta salad recipes to give you more inspiration. 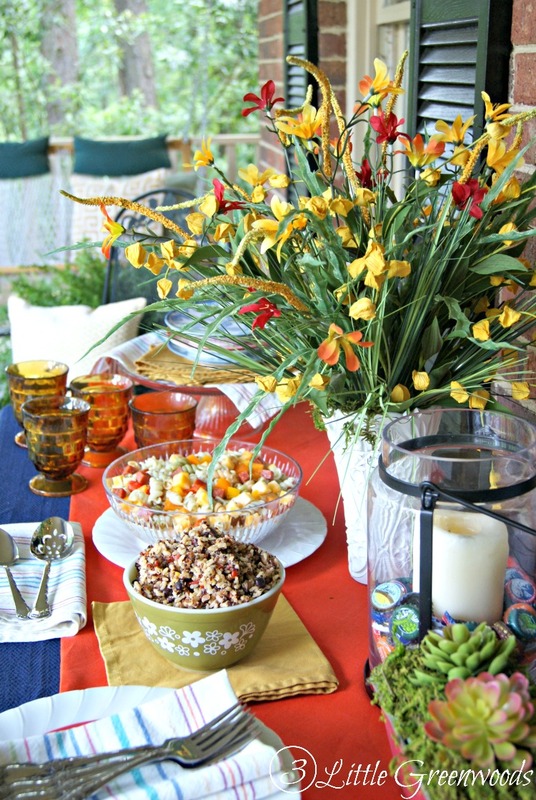 Creating a fun and festive table doesn’t have to be difficult. 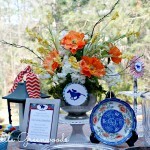 Simple use the summer table decorating ideas that I have shared to add a little bit of flare to your tablescape. 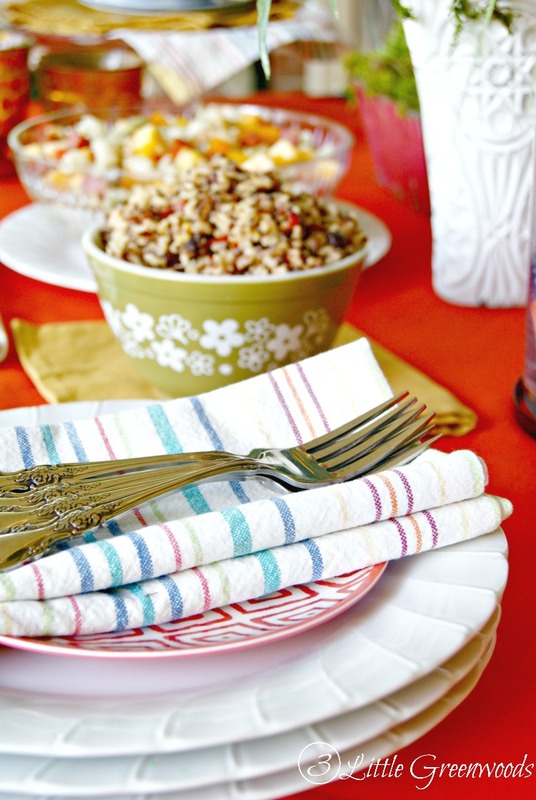 Inexpensive linens, basic white dishes, and a few pops of color is all you need. I am so excited for summer grilling season and all the fun get togethers we are going to have. Honey is going to grill something wonderful for me to pair with a delicious summer pasta salad. My favorite is Southwestern Pasta Salad: rotini pasta, vegetable oil, lime juice, chili powder, ground cumin, salt, cloves garlic, whole kernel corn, black beans, diced green bell pepper, diced red bell pepper, fresh cilantro leaves and chopped roma (plum) tomatoes. Oh my goodness! That pasta salad sounds awesome! I like to add eggs in mine. 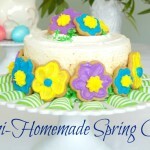 Love it all… I do spy one of my favorite pyrex patterns – the crazy daisy! Is that the name of that pattern? The little green bowl is from my grandmother and I love it dearly! I do too! I meant to grab some at Publix but forgot. Have a wonderful weekend! Extra bacon always makes things tastier! Everything looks beautiful -from the table decor to the food. Awesome! I’ve always been a pasta salad fan, I was the weird kid scooping heaps of it onto my plate instead of the main course 🙂 I’m so totally jealous of your pretty porch! Me too! I totally love pasta salad and would choose it over the main meal any day. Those salads look delish!!! I had no idea those salad boxes even existed! How easy!!! Will definitely be trying them with our burgers this weekend! 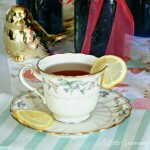 Have a wonderful weekend, sweet friend! I LOVE Suddenly Salad! 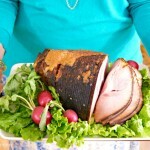 I served it at my Mother’s Day Luncheon and everyone asked for the recipe. I was a little embarrassed that it was so easy to make! 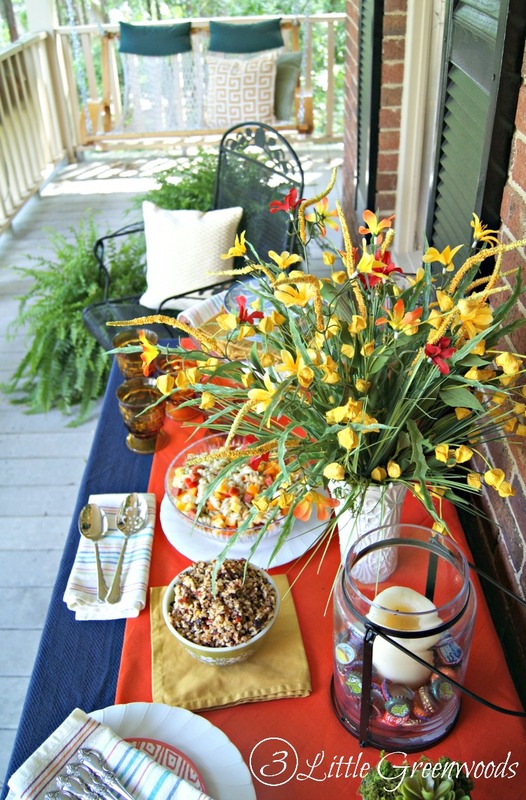 Love your summer table decor and your porch. It’s all beautiful! I’m coming over! I like to add kalamata olives and grape tomatoes. I love your porch and the food looks so yummy! Thanks, Lindsay! Have a wonderful weekend! I like summer pasta salad. I would add chicken and fresh basil. Oh those would be great additions! I really love clean and simple pasta salads… no mayo or heavy stuff please 🙂 Great recipe! Thanks so much, Jennifer! I love this summer pasta salad too! I love cubed cheese in my pasta salad! And, I that green bowl in the picture brings back memories. My mom had one just like it! It’s funny how certain dishes can bring back those wonderful memories, isn’t it? I love those flowers in the centerpiece! Flowers totally make a pretty table, don’t they? Thanks so much for stopping by! I love your beautiful table settings. You make summer look good! Your table setting looks beautiful, and the pictures are very clear. Now I want to start decorating our table instead of our plain dishes, silverware and cups. 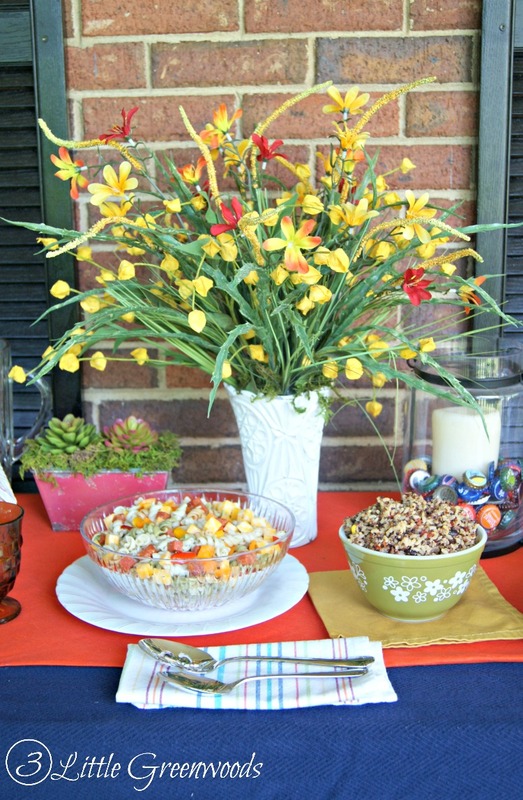 The table scape is beautiful and that pasta salad from Publix looks delish! My favorite add on is probably peas or black olives! I love to add vegetables whenever I can! I love pasta salad, my favorite add in is olives. My favorite pasta salad add-in is pepperoni. Love your table and the bottle caps in the candle holder really caught my eye. Have a Happy Memorial Day! I love the table, looks beautiful! This is a beautiful set up! I am impressed if this is how you set the table for dinner. I love having summer food, it is all so yummy! What a great spread! I love those little half dishes the cheese is in! This looks delicious!! And love how you set up the table – pretty flowers! The table is beautiful. I would be afraid to eat or mess up anything. These pasta salad options look delicious. I was turned away from pasta salad when I was younger – being from the South, ladies tended to utilize heavy creams, mustard, etc etc but when I started making it myself and realizing how nice it was with lighter flavors I became hooked! Kudos to your beautiful centerpieces and table settings! 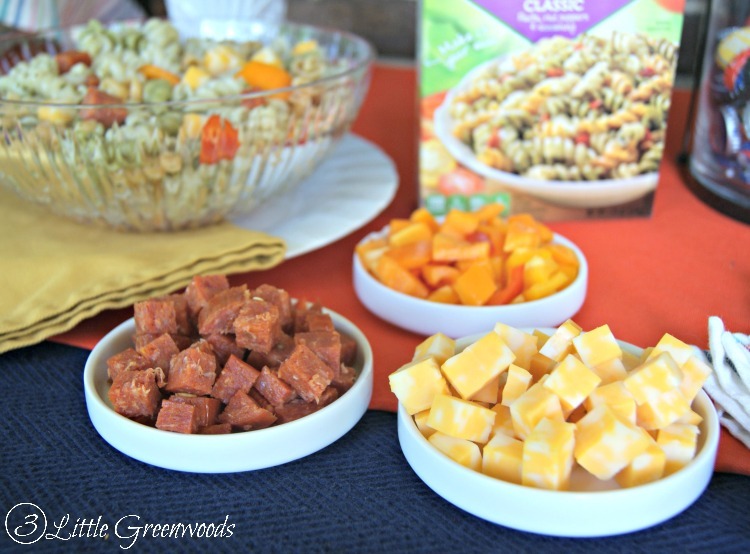 I love chopped salami in my pasta salad…speaks to my Italian side! I am loving your decoration ideas! So pretty. Suddenly Salad is such a great go-to for entertaining. My favorite thing to mix in is sauteed asparagus! It only takes about 5 minutes to cook them in a skillet, so it’s still a super quick dish to throw together. Oh asparagus sounds like a wonderful addition! Thank you so much for the comment love! Everything looks so pretty, Ashley! I love adding lots of chopped, fresh veggies in pasta salad. Pepperoni and colby jack cheese sound amazing too! Thank you so much! I do love a pretty centerpiece! My favorite pasta salad add-in is sliced mozzarella cheese sticks. Can you please come over and decorate? That tablescape is beautiful! You are too sweet! Thank you so much for the compliment, Chene!